Have dry hair? Use a dollop of coconut oil as a hair mask. Experiencing stubborn acne that you can’t seem to shake? Try the oil cleansing method or oil pulling with coconut oil. Looking for a natural way to whiten your teeth? Swish with coconut oil once per day instead of your regular mouthwash. Looking for a new natural way to accelerate your metabolism to lose those last few pounds? Switch all your cooking oils and butter to coconut oil. Does your long haired puppy get terrible mats that seem painful to brush out? Feed him a small spoonful of coconut oil every other day. What can’t be done with coconut oil? It seems that over the last five years coconut oil has gained a reputation as the magic oil that has the power to cure just about anything. With so many super powers, we found ourselves wondering if coconut oil is really all that it’s cracked up to be. If you’re just as curious as the coconut oil craze as we are, keep on reading. After doing some research, we found that about ten years ago the media was actually totally against the tropical oil! The reason being that it has high levels of saturated fat, which have been found to be harmful when trying to maintain heart health. So why haven’t we heard about this or any of the other negatives lately? Well, things have changed in the last decade, and the quality of coconut oil is much higher today. 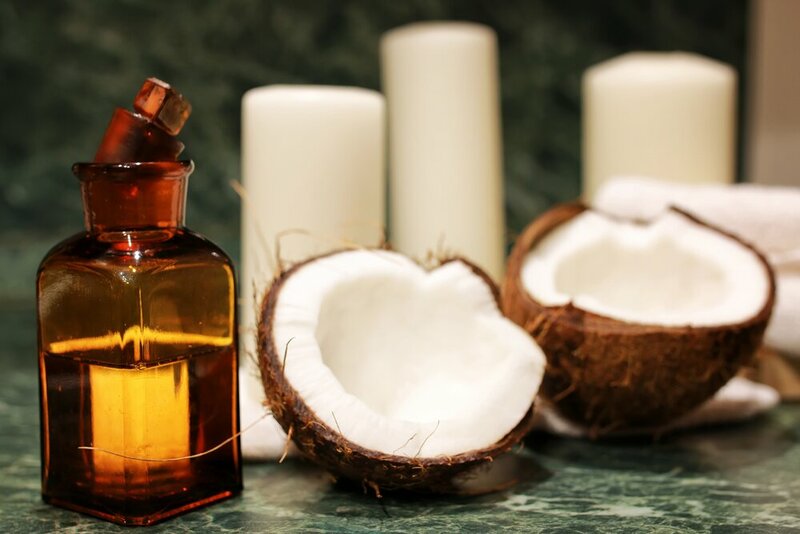 The coconut oil that was once sold to the masses was very highly processed often times bleached to achieve the desired color and contained fragrance to maintain and preserve that perfect tropical smell. Today, the coconut oil that the media raves about is that which is organic, unrefined, virgin coconut oil. According to Kristin Kirkpatrick MS, RD, LD, the coconut oil that we read about and consume today does, in fact, contain nutrients and properties that are quite promising in holding up to the claims made. That said, there still needs to be much more research dedicated to finding out whether or not coconut oil should be coined as a super food. As far as health and beauty go, it is safe to use the organic, unrefined, virgin coconut oil on your body. Just as you should with any other new product, it is highly recommended that you do a skin patch test first, as some people have slathered the oil from head to toe only to wake up with a body full of hives the next morning, and find out that they are highly allergic to the many of the properties it’s composed of. Although this isn’t common, it’s not optimal either. Let your skin get used to the oil over time, and as long as you’re not developing any strange rash, you should be fine. If you want to try the oil cleansing method, do your research. You will find that research with supports this method when incorporating other oils that benefit your skin type. Additionally, there is plenty of research out there which supports the claims that coconut oil will help with weight loss. We say to give it a try, but don’t expect to wake up a dress size smaller after just a few days of use.